Municipal leaders, advocates, and engineers in cities from Toronto to Tulsa, take note: The absurd debate about whether or not investing in bicycle-friendly streets is good for cyclists (and everyone else) is over. Done. Kaput. No longer deserving of a moment of your attention. This debate has divided and distracted bicycle advocates for decades. I won’t give it any more air time here, and at any rate there is nothing new to say, but if you’re interested in exploring the one cycling topic more tediously and verbosely discussed than helmets, maybe start here. 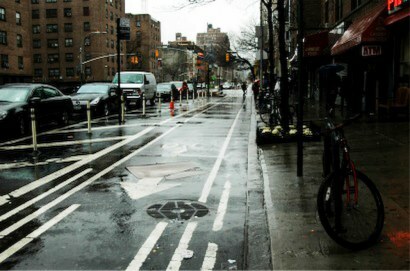 For finally making the common sense of bike infrastructure in the US indisputable, we have the intrepid folks in New York City to thank. They have proven excellent in recent years at not only installing human-scale bike infrastructure, but quantifying its impacts. Protected bike lanes do cost money to install—with every penny furiously contested—but next to nothing compared to routine roadway maintenance and expansion projects. And instead of continuing to cost the community, they boost business, grow the tax base, and save money for the people who use them. And they even create smoother traffic flow for people who must still drive. What’s not to love? No more debates, no more excuses. We cannot afford *not* to invest in safer, more profitable streets for cycling—and for everyone. And we likewise cannot afford to give a moment more of our energy to engaging or debating with so-called bicycle advocates who persist in fighting against improvements that are essential to our communities’ health, safety, and solvency. The real debate should not be about whether or not to invest in bike infrastructure, but about how your city can create the most, the fastest. It’s time for us to move on. If your city’s leaders don’t get this, it’s time for them to move on too. PS: Here’s some more analysis from BikePortland. Another note: I further make the economic case for bicycling in my forthcoming book, Bikenomics: How Bicycling Can Save the Economy (Dec 2013, Microcosm). I’ve also written extensively about this online and have an older zine on the topic available here.